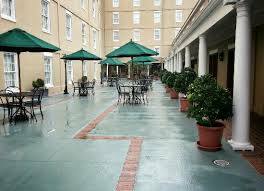 The DoubleTree by Hilton Hotel & Suites in Charleston's charming Historic District. DoubleTree by Hilton Hotel & Suites Charleston-Historic District overlooks the Charleston City Market in the very heart of the city. The Charleston, SC hotel offers 212 guest rooms and suites, which are among the largest found anywhere in downtown Charleston. All guest rooms and suites are furnished with 37-inch flat-screen televisions, and suites offer wet bars and mini-refrigerators. All guests enjoy complimentary WiFi and access to the on-site fitness center.